Classics are never out of style, and with the runways and stores filling up with navy stripes and nautical themed accessories, this classic style is seeing a revival. Light and airy with plenty of white to keep it feeling bright and lively, nautical is expressed best with two colours- bright red and navy blue. Mixing in stripes and whimsical patterns with sailboats, anchors and coral, this style is perfect for a household that is upscale but playful. Put emphasis on the navy blue and use a bold red in smaller doses for a good balance without coming off forced. This is a stunning room, with a coral inspired chandelier and matching sconce in a perfect pop of red! 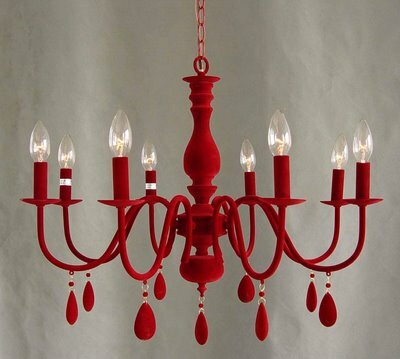 Try this chandelier in a velvet finish for a luxurious pop of colour. A great arrangement with a white on white palette, washed out hardwood and piled with pillows. See the red piping on one of the throw pillows and vintage anchor leaning behind the sofa as a great nod to nautical style. A striped sofa provides visual interest and provides a leaping point for the blue tones in the accessories. Not ready to commit? Play with throw pillows- they are an instant pop of personality and one of the easiest pieces of decor to rotate and replace. Decorate with pieces of coral, seashells and colour blocked books to make a statement. 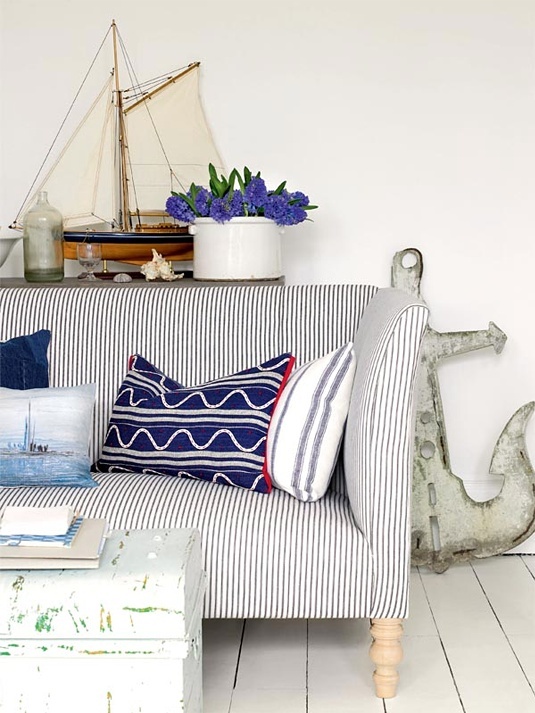 Utilize alcoves like this to showcase your personal style and add the nautical twist for a fresh touch! Previous Post A question for you! Hello. 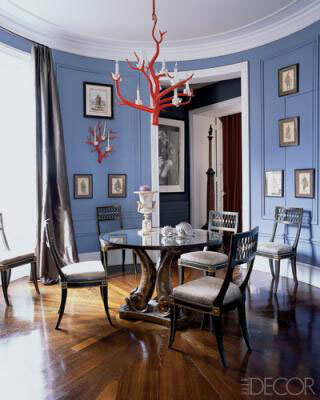 Where can I buy the chandelier in a velvet finish for a luxurious pop of colour?